"This truly is the most delicious stuff! 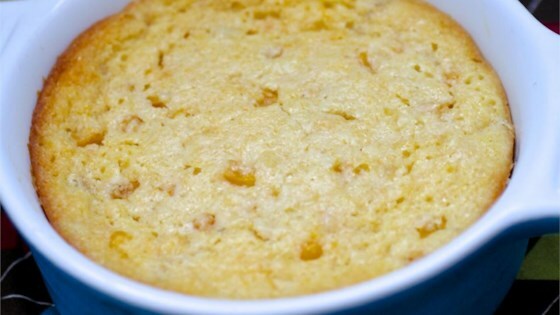 A bit like a cross between corn souffle and a slightly sweet corn pudding! Try it, I know you will love the ease of preparation and especially the taste. Everyone always wants the recipe! Note: The ingredients can be doubled and baked in a 9x13 inch baking dish in almost the same amount of cooking time." Very easy, but you really have to love corn to love this dish. I added some chopped onion (and used low fat sour cream), but it was still a bit bland. I will probably not make it again. Has anyone ever made this in advance? I'd like to make it for Thanksgiving and it would be so much easier if I could just make it the night before. HELP! This was fabulous! It tasted like corn pudding-perfect with chicken.